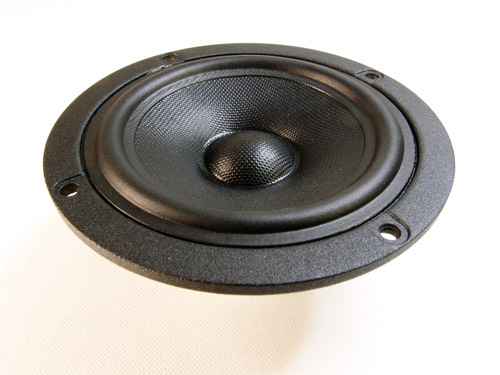 After the large 4-way ATS speaker project I needed to do something really small! This year ScanSpeak launched two small mini drivers, one 2-inch and one 3½-inch. Both full range drivers. The 2-inch is ear-marked for small laptop mini systems, where the 10F leaves a lot of options for further investigations. The 10F is quite remarkable being fairly flat from 100 to 16000 Hz and I can see this driver being used in a) grown-up laptop mini system, b) Bose up-grade (The Cube speakers), c) midrange driver in smaller 3-way systems, and last but not least, d) upper mid-driver in a 4-way 1st order system like the Vandersteen constructions. 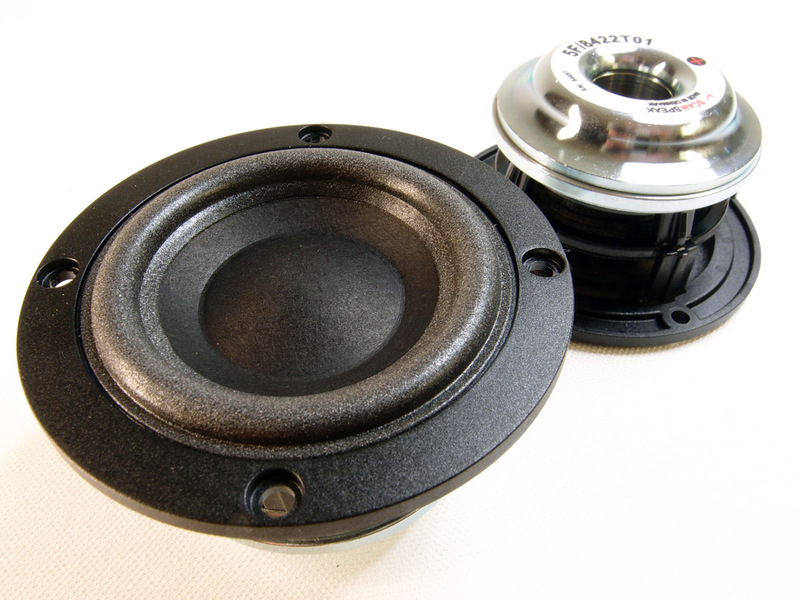 1st order systems takes a small extremely wide-banded driver to mate the mid-bass and the tweeter. The 3-way will certainly be explored in a future project on a dedicated 3-way book-shelf speaker tuned for near-wall placement. Please do not ask when! The 5F/8422T01 is quite a surprise! The smallest ScanSpeak ever made I think. This must be the Rolls Royce of tiny speaker drivers. 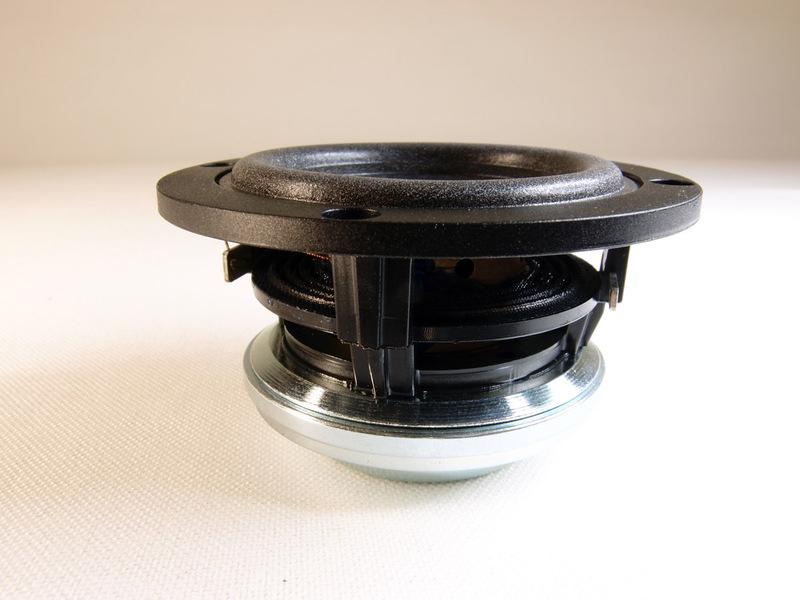 22 mm titanium voice coil former, machined magnet parts, neodym magnet, one-piece paper cone, foam surround (I like that! ), a thoroughly vented chassis and magnet system, etc. This driver is claimed having a frequency response down to just below 100 Hz and there's a price to pay for this: Efficiency. We're talking something in the range of 80 dB/2.8V and if we average my measurements, this is what I find. Now, a 2" driver certainly isn't supposed to energise large rooms, rather being placed on your desk next your laptop, and via an e.g. DAC/AMP serve as a mini system for your digital files. To this end I bought a smal DAC/AMP from China. 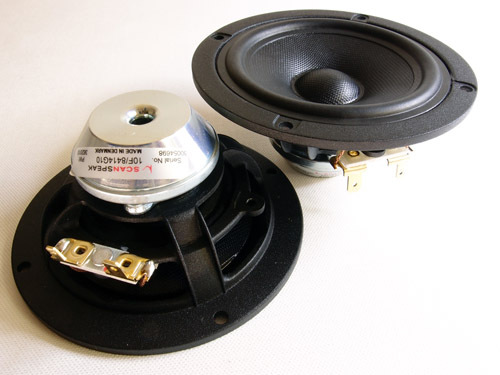 These devices, which can be found on eBay, sells for some 100 USD and delivers 10 watts, enough to drive the 5F speakers to adequate levels. NAD has a neat DAC/AMP, D-3020, that would be more than suitable for this, but at 500 USD a bit more than I'm willing to pay for my laptop system. The Chinese DAC/AMP set-up will be reported as soon as possible and the 5F drivers will be placed on a small open baffle, the smallest OBL I've ever made! The 5F/8422-T01 has a Qt of 0.61 and modeling this driver looks a bit strange. A 2 litre box makes Qtc = 0.7 and F3 = 104 Hz. Now, we're certainly not going to make a two litre box for a 2-inch driver; doesn't work. Bass reflex? Hmm...0.5 litre volume and a port tuning of 60 Hz (port = Ø 12 mm x 13 cm (!)) lifts the response in the 100 Hz region some 1.5 dB and produces F3 = 93 Hz. Actually what ScanSpeak claims. This may not be bad at all. On an open baffle we should make almost the same F3, so this is what will be tried. My desk is close to the wall and I rely on some room (desk-) gain to enhance bass response. But before all this fun, here are some measurements. I didn't do the TS data and rely on the data provided by Scan-Speak. Sorry, forgot to add a match box next to the drivers. Diameter is close to the length of a Danish match box. This is how small they are. Left: Frequency response on a 65 x 100 cm baffle merged at 450 Hz with near-field response. Right: Same measurement shown for the 100-10 kHz range. Not bad at all. Preliminary listening tests suggests a surprisingly smooth response and I honestly don't worry about the 8-20 kHz range looking a bit ragged. The CSD plot below strongly suggest no serious resonances in this region and the response is merely a consequence of cone geometry. Left: Horizontal dispersion at 0, 10, 20 and 30 deg. Right: CSD with 25 dB scaling. No serious resonances until well above 20 kHz. Harmonic distortion at 2.8V (left) and 5.6V (right) input. Surprisingly low it appears. Left: The distortion measurements above made me try increasing input another 6 dB and we see the same picture. This is in the range of 92 dB/1 meter. 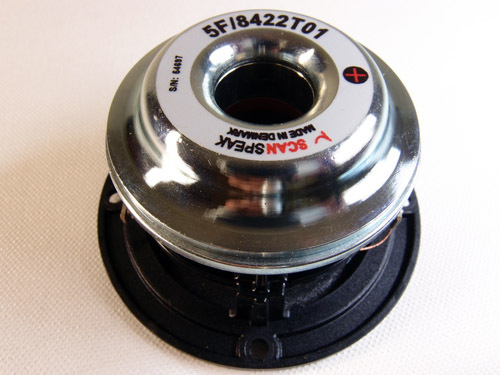 This tiny fellow features a metal basket contrary to the 5F's plastic housing. Coated fiber glass membrane and rubber surround. The 14 mm voice coil former ensures low mass, enabling the driver to reach some 16 kHz. My thoughts about the use of this driver can be found in the intro. 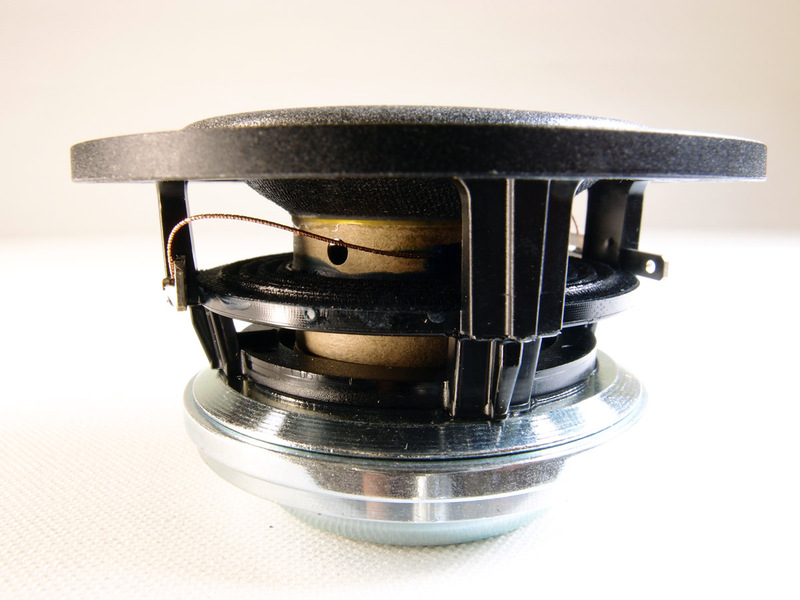 I once had a pair of Heco loudspeakers, a small 3-way system, Professional P3000, featuring a 6" midbass, a 3-4 inch middriver and a dome tweeter, long before dome tweeters became standard. 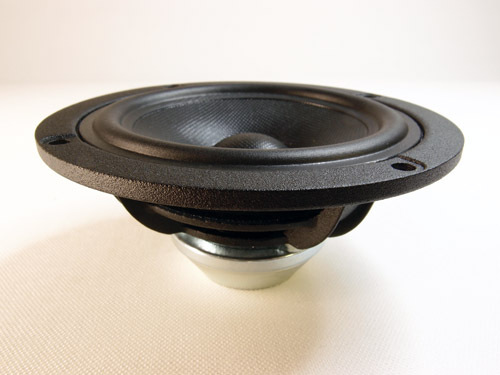 I was always amazed by the midrange presence quality of these speakers, most likely derived from a well-designed and well-integrated midrange driver. This is what I would like to recreate from using the 10F as a middriver, covering all of the upper midrange and lower treble area. We'll see how this turns out. But first some pics and measurements. Having Qt = 0.51, this driver may be fitted into a 2 liter close box providing an F3 = 134 Hz, not too impressive. Despite the high Qt a vented 2 litre box with a low port tuning of 60 Hz provides an F3 = 90 Hz. This is more like it, but in reality different types of cabinet must be tried to find the best solution for this kind of driver. Left: SPL from 2.8V input and a 65 x 100 cm baffle, merged at 250 Hz with nearfield response. This driver is some 5-6 dB more efficient compared to the 5F driver and makes it suitable for medium efficiency two- to three-way systems around 88-89 dB. A midrange should not necessarily have the same efficiency as the bass driver as the midbass and treble units, at least from LR2 filters, will add to the overall midrange response. Right: Horizontal dispersion @ 0, 10, 20 and 30 deg. Left: CSD with 25 dB scaling. Quite a clean performance throughout the treble range! Right: Step response showing a better decline compared to the 5F. Left: Distortion measured at 2.8 V input at 0.25 m distance. Right: Same with 5.6 V input. This driver features very low distortion indeed, much better than many tweeters can do. 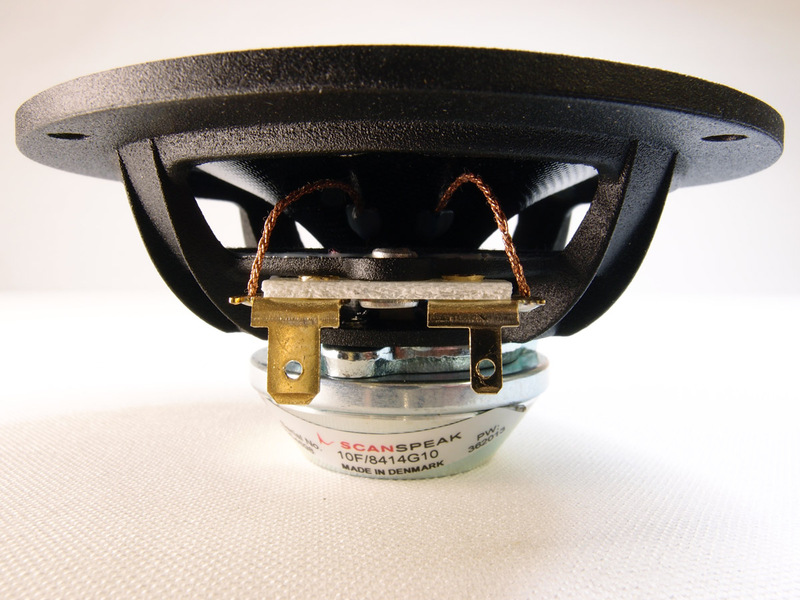 How about a 2-way from a 6" midbass and the 10F covering the 500-16000 Hz range? No crossover in all of the treble range! Well, well, well, this driver certainly has many applications.